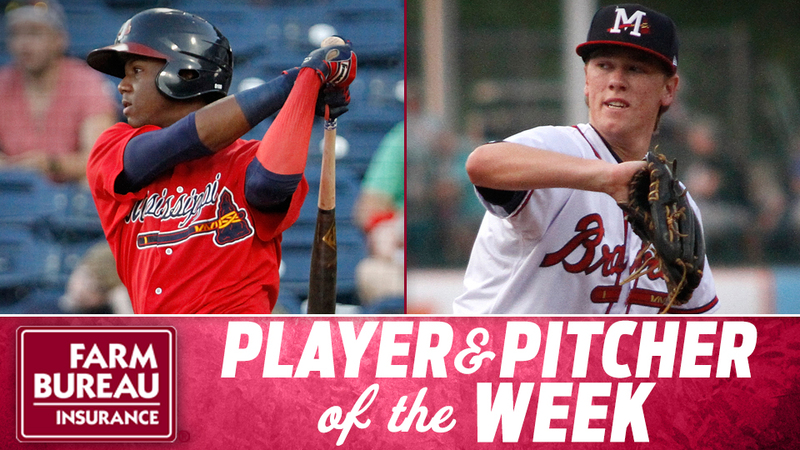 PEARL, MS -- Mississippi Braves outfielder Ronald Acuna and LHP Kolby Allard have been named Mississippi Farm Bureau Player and Pitcher of the Week for the week ending Sunday, July 9. Acuna, 19, posted a .400 average (8-for-20) with one double, two homers and five RBI in five games during the week. He is hitting .325 with 21 extra-base hits, 29 RBI and 18 stolen bases (third-best in the league) in 54 games since joining the M-Braves in May. Acuna was named Braves Organizational Player of the Month at Double-A Mississippi after posting a .415 batting average with seven doubles, a triple, three homers and 15 RBI in 21 games during the month of May. The young prospect was hitting .287 with three doubles, five triples, three homers, 19 RBI and 14 stolen bases in 28 games at High-A Florida before his promotion. As ranked by Baseball America, the Braves No. 6 prospect spent most of last season at Low-A Rome, hitting .311 in 40 games. A native of Venezuela, Acuna was signed by the Braves as a non-drafted free agent on July 2, 2014. Allard, 19, picked up the win and held Mobile to six hits over five frames with one walk and six strikeouts. He surrendered three runs but they were all unearned. Allard is 5-6 with a 2.88 ERA in 17 starts for the M-Braves this season. The southpaw was named Braves Organizational Pitcher of the Month at Double-A Mississippi after going 1-1 with a 1.67 ERA in five starts during the month of April. As ranked by Baseball America, the Braves No. 3 prospect currently ranks ninth among Southern League Leaders in ERA. Allard went 8-3 with a 2.98 ERA in 16 starts between R-Danville and Low-A Rome last year. A native of San Clemente, CA, Allard was selected by the Braves in the first round of the 2015 draft.